One of the challenges service providers have faced in the last decade is lowering the cost per port or per MB while maintaining the same level of availability and service level. And then add to that the constant pressure from subscribers to increase capacity and meet the rising demand for realtime content. This can be an especially daunting task when routers with the feature sets ISPs need cost an absolute fortune – especially as new port speeds are released. Whitebox, also called disaggregated networking, has started changing the rules of the game. ISPs are working to figure out how to integrate and move to production on disaggregated models to lower the cost of investing in higher speeds and feeds. Whitebox often faces the perception problem of being more difficult to implement than traditional vendors – which is exactly why I wanted to highlight some of the work we’ve been doing at iparchitechs.com integrating whitebox into production ISP networks using IP Infusion’s OcNOS. Things are really starting to heat up in the disaggregagted network space after the announcement by Amazon a few days ago that it intends to build and sell whitebox switches. As I write this, I’m headed to Networking Field Day 18 where IP Infusion will be presenting and I expect whitebox will again be a hot topic. This will be the second time IPI has presented at Networking Field Day but the first time that I’ve had a chance to see them present firsthand. It’s especially exciting for me as I work on implementing IPI on a regular basis and integrating OcNOS into client networks. IP Infusion has been making network operating systems (NOS) for more than 20 years under the banner of its whitelabel NOS – ZebOS. As disaggregated networking started to become popular, IPI created OcNOS which is an ONIE compatible NOS using elements and experience from 20 years of software development with ZebOS. What does a production OcNOS based MPLS network look like? Here is an overview of the EVE-NG lab we built based on an actual implementation. Although certainly not a new use case or implementation, MPLS and VPLS are very expensive to deploy using major vendors and are still a fundamental requirement for most ISPs. This is where IPI really shines as they have feature sets like MPLS FRR, TE and the newer Segment Routing for OSPF and IS-IS that can be used in a platform that is significantly cheaper than incumbent network vendors. Unlike enterprise networks, cost is more consistently a significant driver when selecting network equipment for ISPs. This is especially true for startup ISPs that may be limited in the amount of capital that can be spent in a service area to keep ROI numbers relatively sane for investors. 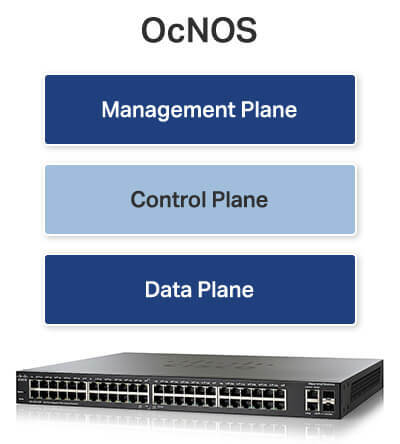 In the lab (and production) network we have above, OcNOS is deployed as the MPLS core at each data center and MikroTik routers are being used as MPLS PE routers. VPLS is being run from one DC to the other and delivered via the PE routers to the end hosts. Because the port density on whitebox switches is so high compared to a traditional aggregation router, we could even use LACP channels if dark fiber was available to increase the transport bandwidth between the DCs without a significant monetary impact on the cost of the deployment. The type of switches that you’d use in production depend greatly on the speeds and feeds required, but for startup ISPs, we’ve had lots of success with Dell 4048s and Edge-Core 5812. How hard is it to configure and deploy? If you know how to use the up and down arrow keys in the bootloader and TFTP/FTP to load an image onto a piece of network hardware, you’re halfway there! The configuration is relatively straightforward as well if you’re familiar with industry standard Command Line Interfaces (CLI). While this lab was configured in a more traditional way using a terminal session to paste commands in, OcNOS can easily be orchestrated and automated using tools like Ansible (also presenting at Networking Field Day 18) or protocols like NETCONF as well as a REST API. I’ve included the configs from the lab in order to give engineers a better idea of what OcNOS actually looks like for a production deployment. StubArea51.net has a whitebox/disaggregated networking Facebook group!